A computer is an electronic device that has the capability to take input from outside, process those inputs and generate outputs. So basically a computer has three fundamentals unit. The input units may be a keyboard, mouse, joystick scanner etc. The processing unit is the unit that processes the input data, this type of units includes CPU, audio processor, video processor etc. 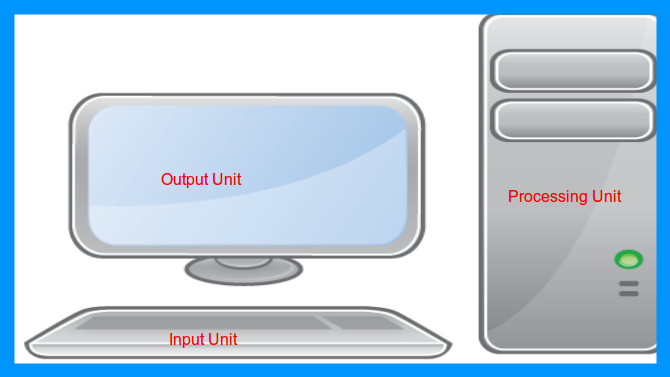 And the last one that is the output units may be a printer, monitor, speaker etc. Time Saving: The computer as a machine can complete thousands and millions of task in nanoseconds and picoseconds. So it saves lots of time. High Speed processing: Computer is a high speed device. It can complete millions of tasks in few seconds or few milliseconds which may even not be possible for a person, year after years. Storage Capacity: The computer has the data storage capacity. So data can be retrieved whenever necessary. Accuracy: The computer is less error prone than the human being. It performs it’s task efficiently and accurately. Automation: The computer is an automatic machine. So as soon as a task given to the computer it performs the task automatically. Efficient Communications: Due to computer, efficient communication is now possible. Now we can communicate with any body staying in any corner of the world. Reduction in paper works: The use of computer has helped in reducing the use of paper works, which is costly. Indirectly or directly reduces tree cutting. Faster searching: The computer has the capability to find any stored data or records in few seconds. Which is not possible in manual paper works. Along with advantages being a machine computer has some disadvantages also, following are the disadvantage of computer. Dependency: The computer is fully dependent on the instructions which need to be provided by the user. Ever changing technology: The Technology changes very frequently. One always need to keep himself up-to-date with the technology. Security issues: Providing security to the system is a complex task. Often security issues occurs when the system connects to Internet, because millions of user is there on the Internet.